Few musicians have generated such a mixture of respect and revulsion as Herbert von Karajan. It takes Richard Osborne 851 pages in his masterly biography to capture the essence of this extraordinary conductor, entrepreneur and opportunist, and it would be impertinent to even attempt to cover the same ground here. So instead, with the centenary of Karajan's birth falling on April 5, I offer this personal vignette from my time at EMI, which I hope in some small way illustrates the conundrum that was this extraordinary man. 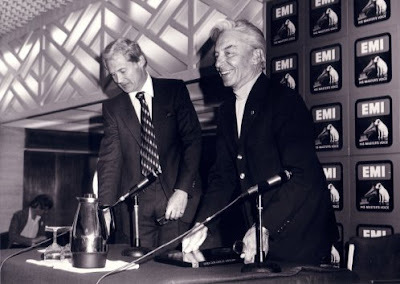 During the late 1970s the Machiavellian Karajan had carefully nurtured a deadly rivalry between EMI and his other contract company, Deutsche Grammophon. This meant that EMI had, at very considerable expense, outbid DG for the four act version of Verdi's Don Carlos with José Carreras and Mirella Freni, and Debussy's Pelléas et Méliande with Frederica von Stade and Richard Stilwell. 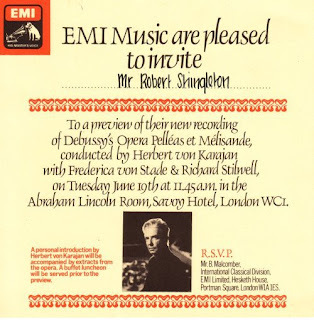 Pélleas was a personal passion of Karajan, and because of this he agreed to make a very rare personal appearance to promote the release of the recording when he was in London in 1979 on a Berlin Philharmonic tour. 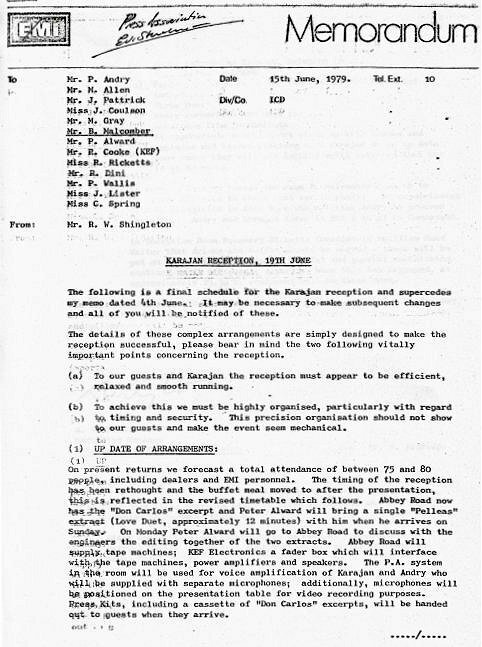 It fell to a small team headed by me to organise a 'money no object' Karajan event to prove that anything Deutsche Grammophon could do EMI could do better. At this point I have to confess that several of us were slightly ambivalent about Karajan's personality if not his music making, so we decided that the event should mirror the maestro and be just a little bit over the top. Karajan and his Berlin band were rehearsing in the Royal Festival Hall with one of their 'drive-thru' programmes, including Ein Heldenleben if my memory serves me right. So we booked the Abraham Lincoln Room (yes really) in the outrageously expensive Savoy Hotel directly across the Thames from the hall. Our over the top plans included equipping all my team with personal radios (this was decades before cell phones) and communicating with each other military style, with HvK code-named The Eagle. Staff were stationed at the stage door of the Festival Hall to brief us when Karajan was en route, and the company's limo with vanity plates EMI 1 was used to transport the conductor. (Those were the days of company limos, I bet everyone in EMI today has a Tata except Guy Hands). We were explicitly told that the maestro did not eat in public, so the journos were fed the most expensive buffet in company history while Karjan enjoyed a hero's life across the river. Bang on time the Eagle appeared at the Savoy and Peter Andry, director of EMI's International Classical Division, who was also my boss and a Karajan confidant, chaired a flawless presentation which included the conductor talking passionately about Pélleas, a stunning playback of the love duet from the opera, and questions from the journalists. The header photo was taken at the end of the presentation and Peter Andry is with Karajan; it is from my personal files and may not have been published before. As the presentation ended Andry thanked Karajan and the conductor left the platform to lively applause. Then came the pièce de résistance. My indefatigable secretary was stationed to the side with a bouquet of the Savoy's finest flowers which probably cost the equivalent of half EMI's current classical recording budget. Only one problem; nobody had told us that as well as not eating in public the maestro did not accept flowers in public. Karajan rudely brushed Rosemary aside and fled for the door leaving a very red-faced secretary clutching a huge bunch of flowers watched by eighty highly amused journalists. So there we have Herbert von Karajan. Inspired music maker and totally self-serving personality. Even after almost thirty years I can't hear the love duet from Pelléas without thinking of the cost of those flowers. Happy birthday maestro, wherever you are. Lots more Karajan links here. Peter Andry, who is seen in my header photo with Karajan, master-minded many great EMI recordings including one of my personal favourites, Karajan's 1970 Dresden Die Meistersinger von Nürnberg. Before joining EMI Andry was a Decca producer and his recording of the Ernest Bloch String Quartets should be in every CD collection. Read more about it here. Was the poor secretary at least allowed to take the flowers home? Nice thought VV, I think she was. These days they would have to be declared to the Inland Revenue as a taxable benefit in kind. I feel for the poor secretary... but it's hardly Karajan's fault is it? Granted, he could have accepted the flowers, but the fact is that he thought them unnecessary.